Company history-Dar Jia Fiberglass Reinforced Plastics Co., Ltd.
2015 Obtained ISO9001:2008 quality certification. 2010 Obtained ISO9001:2008 quality certification. 2006 Conducted joint research with Feng Chia University on the technology to combine thermoplastics and thermosetting plastics. 2001 Conducted joint research on large cover structural calculations with the Department of Materials Science and Engineering, NCKU. 2000 Conducted joint research on aircraft repair material with the Department of Aeronautics and Astronautics, NCKU. 1999 Conducted joint research on honeycomb structure with the Department of Materials Science and Engineering, NCKU. 1998 Conducted joint research with the Department of Aerospace and Systems Engineering, Feng Chia University on building FRP structural calculation program using ASME-RTP. 1997 Conducted joint research on GLASS FLAKE technology with the Department of Materials Science and Engineering, NCKU. 1996 Conducted joint research on double-wall FRP technology with Industrial Technology and Research Institute. 1995 Conducted joint research on FRP underground petroleum storage tanks with the Department of Materials Science and Engineering, Feng Chia University. 1992 Improved THERMOPLASTIC technology by purchasing ARMOUR PLASTIC technology (PVC/F.R.P., C.P.V.C/F.R.P., PP/F.R.P., PVDF/F.R.P.). 1990 Became Formosa Plastics Corporation’s contractor and acquired rubber lining technology from Formosa Heavy Industries Corp.
1988 Collaborated with Japanese Company to acquire Glass Flake Lining technology. 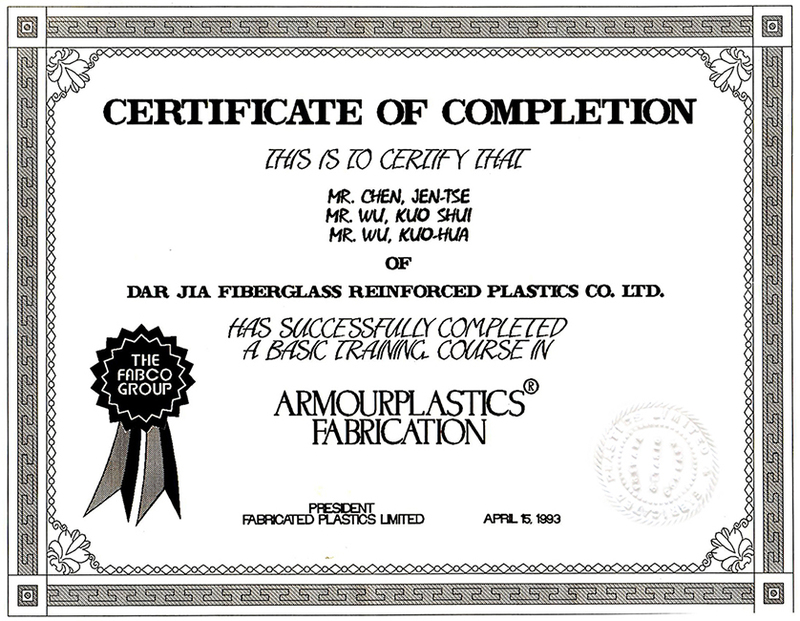 1985 Dar Jia Fiberglass Reinforced Plastic Co., Ltd. was founded.